all I need to complete the set is to take up gardening or farming ! Running or not, I enjoy weather watching and cloud spotting and am not just a fair weather friend of the weather if that makes sense. I love frosty mornings as much as sunny afternoons, get childishly excited when it snows and even like rain. Running in different places with a poor sense of direction has seen me lost on more than a few occasions, but if I stick to an easy landmark and use my eyes over my shortcomings in map reading its usually OK.
Sunday morning in Cambridge the sky was blue after two days of grey , so although my legs felt a bit creaky and my body a bit weary after 2 days of walking everywhere, I knew if I did not run I would regret it later. Maybe it is my imagination but each time I visit Cambridge it seems that on the day I am due to go home – usually a Sunday – the weather is often at its best , and leaving when the sun is shining adds to my feeling of missing or loss. Maybe it just highlights my general low mood , knowing I wont see my daughter again for 8 weeks or so. The route I followed headed out of the city towards Fen Ditton, and beyond. I followed the river starting from Newmarket road and as I could see runners and walkers on the opposite side I knew there had to be a crossing point somewhere. It was a beautiful spring morning – skies blue, sun reflecting on trees and a day full of hope. 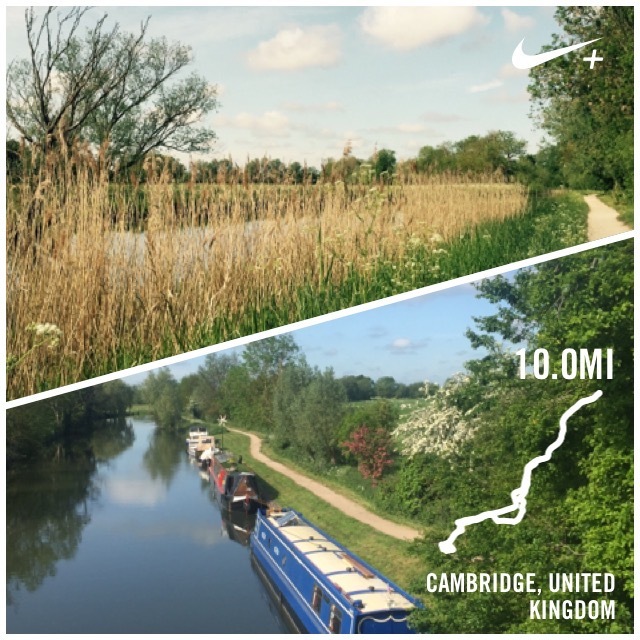 I had no real time pressure and was aiming to do around 6 miles – but once out and enjoying the windless almost perfect running conditions and the fun of exploring new territory – I kept going, crossing at a lock then on a bit further – catching a glimpse of a farmer tending sheep on the opposite bank then turning back for the return leg into Cambridge.